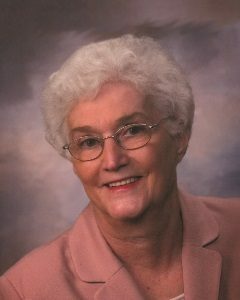 Elizabeth “Bette” Corbid, age 83, of Hutchinson, Minnesota, passed away on Wednesday, January 30, 2019, at Harmony River Living Center in Hutchinson. Funeral Services will be held Tuesday, February 5, 2019, at 11:00 A.M. at St. Anastasia Catholic Church in Hutchinson with interment at a later date. Visitation will be held Monday, February 4, 2019, from 5:00-8:00 P.M. and will continue one hour prior to the service --all at St. Anastasia Catholic Church. A Prayer Service will be held at 7:30 P.M. Monday night at St. Anastasia Catholic Church. In the spirit of celebrating Bette’s life, please feel free to dress in your favorite colors. Bette was born on November 9, 1935, in East Grand Forks, MN to Benedict J. Corbid and Catherine M. Klaras. She grew up in East Grand Forks and graduated from Sacred Heart Catholic High School. She then attended the Sisters of St. Joseph School of Nursing and became a registered nurse in 1955. Bette married Gene Driscoll on November 5, 1955, and together they raised 7 children in East Grand Forks. After many years of nursing at St. Michael’s Hospital in Grand Forks, ND, Bette enrolled at the University of North Dakota and received a family nurse practitioner degree in 1987. She spent most of her professional career working with the elderly, including 13 years at Burns Manor in Hutchinson. Bette loved spending time with family and friends, planting flowers in her yard, shopping for bargains at rummage sales, traveling in her camper, playing solitaire, and watching the Twins and Timberwolves. Bette especially enjoyed creating and looking through old family photo albums while sharing her special memories. Bette’s family will be dressing in bright colors to honor her life, and we invite friends to join us in this celebration. Bette is survived by her children, Timothy Gene Driscoll of Grand Forks, ND; Chuck (Gayle) Driscoll of West Fargo, ND; Nadine (Mike) Paplow of Park Rapids, MN; Polly (Jon) Tack of Antioch, IL; Erin (Greg) Anderson of Oak Park Heights, MN; Beth (Pat) Osowski of Oshkosh, WI; Katy (Kris) Stokke of Spirit Lake, IA; fifteen grandchildren; fourteen great-grandchildren; brother, John (Pat) Corbid; sister-in-law, Karen Corbid; and many nieces, nephews, cousins, good friends and co-workers. She was a member of St. Anastasia Catholic Church in Hutchinson. She was preceded in death by Gene Driscoll; her parents; sisters Nadine (Steve) Balsan and Patricia “Paddy” (Manny) Bertsch; brothers James (Lois) Corbid, Benedict Corbid, and Dennis (June) Corbid. May Bette rest in peace. She was a wonderful co-worker at the Developmental Center in Grafton, ND. She worked very hard at meeting the health needs of the clients who resided at the center. Always a smile and a cheerful greeting is what I will remember most. She attended to my group that I supervised with integrity and a most professional ethic and attitude. She will be missed by all who knew her and had the privilege of working with her. My deepest condolences to the family on the loss of your dear loved one. I know the pain of losing someone you love in death. So I hope that reading Revelation 21:3-4 will give you some comfort. And I pray that the God of tender mercies will continue to bless you and strengthen you through this difficult time. My sincere sympathies to Bette’s family and many friends. Will always be grateful to her for her kind treatment of my husband, Jim, when he was a patient at Burns Manor. He really liked “Irish Bette” and always spoke of her sense of humor, her kindness and bedside manner. She will be very much missed. My heart goes out to you in your loss. Our sincere sympathies to all of you in the passing of your mother & grandmother. Nadine and Erin .. I am so sorry to hear about Bette passing . It was a pleasure to do your moms hair when she was able to come down to see me and lucky for me I got to know you both thru those outings…I will thinking of your families! Extending deepest sympath to all of you. Bette Kay and I grew up together on Pillsbury Ave. in East Grand Forks. We lived next door to each other and spent many hours jumping rope, playing hopscotch and roller skating with scabs on our knees most of the time! She sent me a small roller skate several years ago like the ones we wore with clamps at the toes and a strap around our ankle. It is now in my hutch. She tried to teach me to play the piano but I was hopeless and she gave up–no, her mother gave up! So many happy memories! May God grant you his comfort and peace. You’re in my thoughts and prayers. (A memorial has been given to Sacred Heart Church in East Grand Forks. I’m so sorry that your mom has passed on. I regret not seeing her again after she moved to Hutchison. She and your dad took me in and made me a part of your family. I will pray for her and remember my times with all of you.